In 1949, the UN adopted a decree stating that Libya should become an independent before 1952, and in 1951, Libya declared its independence as a hereditary monarchy. The flag that King Idris introduced was a triband design, of red, black, and green. On the central black stripe, a white star and crescent motif. 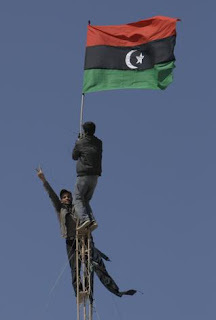 This flag is still used by Libyan opposition overseas, as well as monarchists. In 1969, a small cadre of Officers led by Gaddafi overthrew the monarchy, and took over the nation. Determined to end the concentration of oil wealth in the hands of the King. 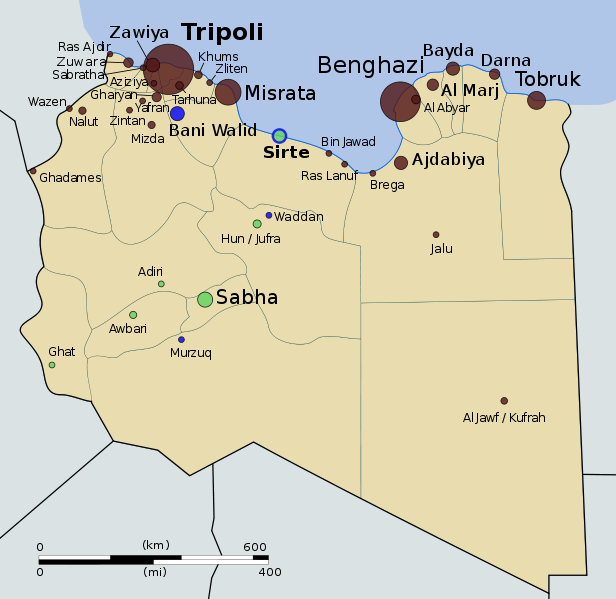 The nation was renamed Al-Jumhuriya al-Arabiya al-Libiya (the Libyan Arab Republic). Gaddafi was named as "Brother Leader." The new leader brought in a new flag, based on the pan-Arab colours, as a simple red, white, and black triband. 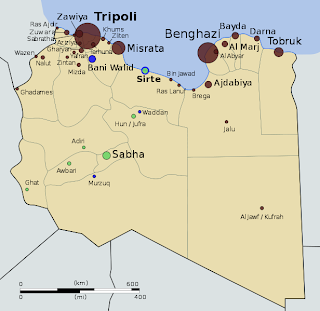 From 1972 to 1977, Libya joined the Federation of Arab Republic, along with Egypt and Syria. 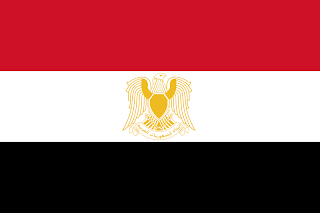 The flag that was adopted took the pan-Arab flag, with the red, white, and black stripes, with the Hawk of Qureish holding a scroll placed in the centre. With the collapse of the Federation, on March 8, 1977, Libya brought in a new national flag, and changed its name once more. This time, the nation was to be called Al Jamahiriya al-Libiya ash-Sha'biya al-Ishtirakiya (The Socialist Peoples Libyan Arab Jamahiriya). At the same time, Gaddafi introduced a new flag. This time, a simple, solid green banner. This was to represent Islam, and his own "Green Revolution." This is the only solid single colour flag in the world. However, after the "Arab Spring" which saw mass public uprisings in Tunisia and Egypt which saw the despotic rulers in each nation overthrown, on the 15th of February 2011 a popular uprising began in Libya, in the east of the nation. The uprising began with the National Transitional Council being set up in the eastern city of Bengazi. 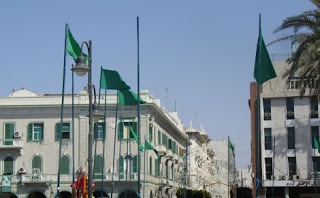 The rebel fighters re-adopted the flag first used on Libyan independence back in the 50's, under King Idris. The red, black, and green horizontal tricolor with a white crescent and star placed in the centre. As it stands, Libya is in a state of flux. The National Transitional Council was set up to guide the transition from Ghadaffi's rule, to a multiparty democracy. They have a lot of work to do, seeing as how in Libya, there is nothing at the moment. No democracy, no political parties, nothing. All these institutions need setting up. Also, the NTC has opted to use a much shortened name, ditching the title used before. 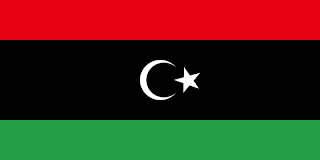 Now referring to Libya is the Libyan Jamahiriya. The NTC has its own logo, a circle, within which is a crescent and a star. The crescent moon is made up of the colours used by the NTC as their new flag. Red, Black, and Blue. Right now, the NTC holds the vast majority of the nation, with only a few cities holding out. Fighting is under way to wrest control of the final few cities under pro-Ghadaffi control. The NTC is recognised by over 80 nations worldwide, as the government in control of Libya. Many other nations refuse to recognise the NTC, such as China. However, they have cut links with the previous regime. We will see how the future unfolds for Libya!